n the mood for a day trip but not sure which direction you want to go or what you want to see? 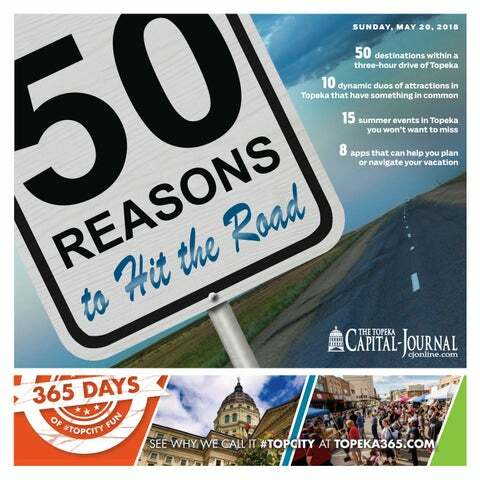 Here are 50 sites and events within a three-hour drive of Topeka that might be just what youâ&#x20AC;&#x2122;re looking for. And who knows, you may end up taking several trips before summer ends. for your chance to win a $500 Hy-Vee Gift Card and to get the best deals in the Topeka area sent straight to your phone via text! For more information visit taponitdeals.com/tapontopeka By texting TapOnIt to 82928 you are signing up to receive recurring text message offers. Message and data rates may apply. 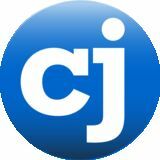 Go to taponitdeals.com/terms for privacy and terms. 49. Omaha’s Henry Doorly Zoo and Aquarium [SUBMITTED] explore polar regions, coral reefs, temperate oceans and the Amazon. Take a ride on a steam locomotive, tram, skilift-like Skyfari or wildlife carousel. Watch a movie on the 41-by-75-foot screen at the Lozier Giant Screen Theater or attend a “Birds of Flight” program in the Meadowlark Theater. hy settle on visiting one site in Topeka when you can visit two on the same day? Doubling up is made sweeter when both stops share common subjects or activities and are within a short walk or drive. Here are 10 pairs of Topeka attractions that pair well. GREAT MURAL WALL S.W. 20th St. and S.W. Western Avenue bit.ly/CJgreatwall The Brown v. Board of Education National Historic Site explores the civil rights movement and the role of the 1954 Supreme Court decision that ended segregation in public schools. The museum is inside Monroe School, which was one of four all-black elementary schools in Topeka. Next stop: Great Mural Wall, a project within a few blocks of the museum that began in 2006 to visually explore the experiences of different community groups through paint. A portion of the wall, “The Road From Brown v. Board,” depicts young people breaking out of stereotypes to become fully realized. COMBAT AIR MUSEUM Hangars 602-604, 7016 S.E. Forbes Ave., Forbes Field combatairmuseum.org The Museum of Kansas National Guard features artifacts, equipment and materials from the history of the Kansas National Guard and 35th Division. View 30 outdoor exhibits, including helicopters, tanks and a howitzer, and more than 100 indoor exhibits, including a mock Civil War encampment and a replica of the officer’s tent from the TV show “M.A.S.H.” Next stop: Combat Air Museum, about a 5-minute drive away, with more than 30 military aircraft from World War I to present day, aircraft engines, military vehicles, artifacts, dioramas and a flight simulator. The Topeka Zoo is home to about 300 animals from around the world. Exhibits include Hill’s Black Bear Woods, Tropical Rain Forest, Discovering Apes, Lions Pride and children’s petting zoo. Next stop: Continue the family fun by walking a block west to the Kansas Children’s Discovery Center, home to interactive indoor exploration areas, a bike and trike path, the TreeTop treehouse and a pond with an aquatic ecosystem. The center is designed for children age 10 and younger. Nature lovers will revel in the color and beauty of the Wade-Meade Historic Site’s 2 1/2-acre botanical garden featuring about about 5,000 flowers and 500 varieties of trees and shrubs. The 6-acre pioneer village at Old Prairie Town also features a prairie mansion; 1854 replica log cabin; one-room schoolhouse; working soda fountain from the late 1800s; and general store. Next stop: The nearly 20-acre Ted Ensley Gardens, which includes meditation garden, rock gardens, annual and perennial beds, rose gardens and water gardens. Other highlights are a panoramic view of the lake; a 60-foot covered bridge over a rocky stream; a gazebo; a pergola; picnic areas; waterfalls; and ponds. The Evel Knievel Museum showcases the world’s largest collection of the legendary daredevil’s performance leathers, jump bikes, memorabilia and Big Red, his 1974 Mack truck and trailer. Climb onto a motorcycle for a virtual-reality jump over 16 cars and try your skill at other interactive games. Next stop: Head south on Topeka Boulevard to Heartland Motorsports Park, Topeka’s hub for drag strip, road course and dirt track racing. The history of Topeka and Kansas is set in stone and cast in bronze along S. Kansas Avenue, where you’ll see likenesses of the city’s historic movers and shakers; a limestone bison; a kinetic, wind-driven sculpture; a giant pencil; and a group of playing children. Next stop: Carry your interest in everything artistic north on Kansas Avenue and across the Kansas River bridge to the NOTO Arts district, where more than 3,000 people visit every month for the ArtsConnect First Friday Artwalk. Enjoy a meal at the district’s many restaurants or shop at its unique stores. BURNETT’S MOUND Skyline Park 3511 S.W. Skyline Parkway bit.ly/CJburnett Abolitionist John Brown with gun in one hand and Bible in the other dominates the massive mural by John Steuart Curry on the second level of the Capitol. Surrounding the firebrand are Coronado with Spanish explorers; a frontiersman with a bison at his feet; a wagon train; a raging prairie fire; and an approaching tornado. Next stop: Burnett’s Mound, the highest elevation in Topeka, where visitors can view the city and imagine the path the 1966 tornado took when it plowed its way through the capital city. Burnett’s Mound is part of the 106-acre Skyline Park, which also features unpaved trails. The Ritchie House, a stone structure built in the mid1850s by abolitionists John and Mary Jane Ritchie, was a station along the Underground Railroad and is considered to be Topeka’s oldest home. After serving with the Union Army in the Civil War, John Ritchie donated land for the establishment of Washburn College and gave land to incoming blacks who agreed to improve the property. Next stop: The final resting place of the Ritchies at Topeka Cemetery, the first organized cemetery in Kansas. Also buried there are Vice President Charles Curtis, Gov. Samuel Crawford, U.S. senator and publisher Arthur Capper, and Cyrus K. Holliday, founder of the Atchison, Topeka and Santa Fe Railroad. The Mulvane Art Museum houses collections of classic, traditional, modern and unexpected art, as well as larger-than-life installations. Visitors can view the artworks and explore the stories behind them. Exhibitions change regularly. Don’t miss the ArtLab in the basement, a hands-on learning center where people of all ages can create their own art souvenir. Next stop: The 10 jewel-toned, custom-made picture windows at First Presbyterian Church, created and installed by artist-designer Louis Tiffany in 1911. The windows depict stories from the Bible. ant to consolidate your vacation travels into a single itinerary? Or maybe you’re on the road and want to know where to buy the cheapest gas or dine on local cuisine. Several apps that can help you navigate your vacation or business trips are no further away than your fingertips. The Travel Channel, CNN and Techradar recommend these travel-related apps, which are all free and available for Android and iOS devices. Google Trips combines the travel bookings and itineraries from a person’s Gmail account and then sorts them into specific trips. Google also provides suggestions on local sites and attractions based on a destination. Google Translate can translate more than 100 languages using several methods, including text translation, which allows an individual to type in a phrase to be translated into a designated language, and conversation translation, which allows two people to talk to each other as the app translates in real time. Don’t be caught out in the rain on a nature hike or stranded in a snowstorm ever again. AccuWeather provides real-time local forecasts in more than 100 languages. XE Currency provides conversion rates for nearly every currency in the world. The information is continuously updated and stored offline, which means a person can use the app when their Internet connection is lost. Expedia, one of the world's most popular travel apps, can help book flights and hotels, rent a car and reserve tickets to tourist attractions. This app allows a person to download a visitor guide for more than 100 cities and then ask for information in a specific category, such as restaurants, shopping, hotels, bars, maps, attractions or recreation. TripAdvisor has collected more than 500 million critiques of hotels, restaurants and events by those who have used or experienced them. After a person chooses a place to visit, TripAdvisor allows them to make reservations. A person can forward emails confirming bookings of flights, hotels and attractions and the app will organize them into a trip itinerary that can be shared with others. Tripit also provides flight notifications and packing advice based on the user’s travel plans. Who says there’s nothing to do in the capital city when the days grow longer and the nights are studded with stars? Here are a few of the events that will make summer in Topeka more fun. • May 20: 30th Annual Menards NHRA Heartland Nationals, 7 a.m. to 10 p.m., Heartland Motorsports Park, 7530 S.W. Topeka Blvd. $45-$65; free for age 12 and under in general admission section with paid adult. heartlandpark.com • June 2: Capital City Family & Food Truck Festival, with food trucks and vendors, 11 a.m. to 5 p.m., S.W. 10th Avenue between S.W. Harrison and S.W. Jackson and S.W. Jackson between S.W. 9th and S.W. 10th. Free. bit.ly/CJfoodtruck • June 2-3: Mulvane Art Fair, with more than 80 artists, food trucks and music, 10 a.m. to 5 p.m. June 2 and 10 a.m. to 4 p.m. June 3, Washburn University, 1700 S.W. Jewell Ave. $10; free for age 11 and younger. mulvaneartfair.org • June 2-3: Germanfest, with food, live entertainment, bazaar, bingo, auctions and beer garden, 8 a.m. to 11 p.m. June 2 and 8 a.m. to 5 p.m. June 3, Sacred Heart-St. Joseph Parish, 312 N.E. Freeman. Free. Find new and exciting places to visit in Northeast Kansas and beyond in our 2018 travel special section.